Love this rug, it is beautiful. Purchased this one and the 8' x 10' rug. I would recommend it, very happy with my purchase. I do like the rug. However, I was surprised how blue it is. Description says coloring is Cream/Light Grey. The rug is much bluer than I expected, shows dark when in an unlit area. I'm going to keep it because I do like. I'll just a new quilt for my bed! 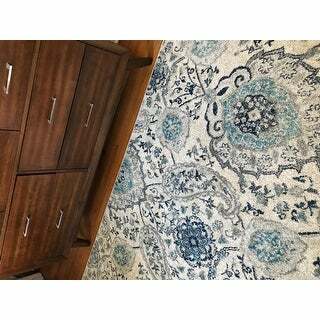 I have other rugs from Safavieh and I love the quality and the pricing. I do recommend this product for anyone. Just be sure you won't mind how blue it is! I am using this in our small guest room bath. It's just nicer to not have to deal with all those bath mats making the room feel even smaller, the 3x5 size covers the area perfectly. Plus, the cotton bath mats I've tried get snagged by the door so I needed a low cut pile rug so the door doesn't catch on it. I use a thin towel-like mat to lay over the rug so it doesn't get wet when people step out of the shower. As for the colors, as other reviewers have mentioned, it's hard to match any computer monitor. 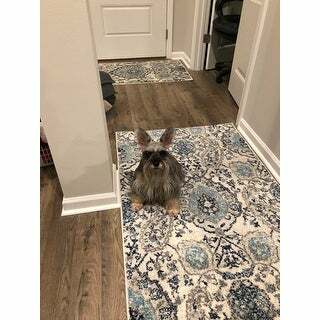 I think mine has a good representation, but the actual rug seems to have an almost navy/purple that I thought was a deep gray around the turquoise pattern. And the colors do seem a bit more vibrant than expected but overall, I'm quite happy for the price and quality. I have bought several Safavieh rugs and have yet to be disappointed with the quality. In my experience they run true to size. Occasionally they arrive with a chemical odor and curl up at the corners, but I find that both issues fade with time. The only issue I have is that you don't always get a true sense of the color and pattern in the photos. This particular style has much more navy in it than I expected. However, it is very pretty and will still fit in well in the area I plan to use the rug. Also, this rug is surprisingly soft and plush for such a low pile. This is my first review of my first overstock purchase and i couldn’t be more excited! 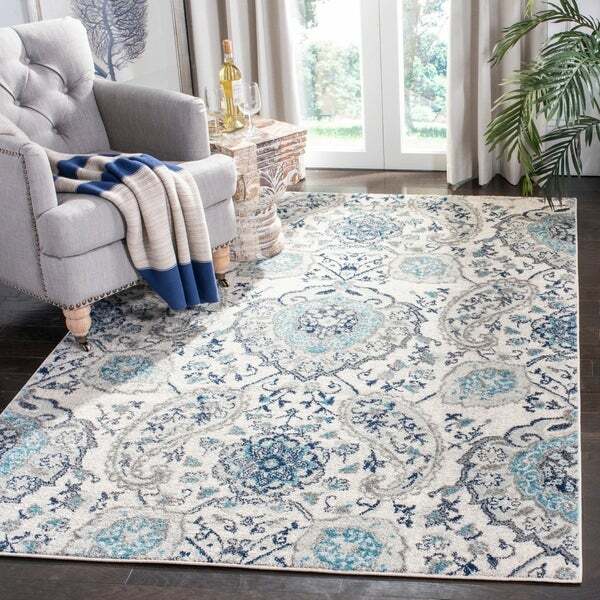 I searched on line as well as local shops for the perfect rug to compliment my new bedroom furniture when i found this beauty. The rug came as promised and once unrolled, i was pleasantly surprised at the quality! The colors are bright but not over the top. No shedding, and the edges are tight so I’m sure it will hold up to the vacuum and the roomba. The price for an 8x10, a 3x5 and a ten foot runner were less than one 8x10 in a normal store! Couldn’t be happier! I bought this rug to go with its 9' x 12' match in my bedroom. It is a beautiful design and plush on the feet. Its made if good quality material and has a really beautiful design with colors that are easy to coordinate with. Comes in many different sizes. Nice rug with soft blue, grey and cream colors. This rug is by our garage door with lots of traffic and it has held up beautifully for 9 months and counting! Would recommend this rug to anyone who loves muted blues and greys and wants a rug that doesn’t show dirt! Happy customer here! I love these Safavieh rugs. I have two more 8x10 rugs in the house and they hold up so well! The blueish/turquoise color in this rug stands out more to me than anything else. Pretty true to the picture and great quality. I love this rug, beautiful colors! I received this rug today. A bit thinner than most Safavieh rugs I have ordered in the past. It is pretty and the color combination is just what I was looking for. I will see if it lives up to what I expect from Safavieh rugs. colors are muted but look like the picture. Design is very nice but would like it to be a bit thicker. This is such a pretty rug! I love the colors and the pattern in it. Don't forget a rug gripper for this, as it slips around no matter if it's on a hard surface or carpet. One corner never relaxed and stays sticking up no matter what we do--that's my only complaint. This piece was bought along with the runner and larger carpet. Our bedroom has a new, bright look. The colors and design look great. The carpet is well-made. There's nothing to dislike about it. Beautiful Rug. I was hesitant to order a rug that I could see and feel in person. When this arrived I was so excited. It’s a beautiful blend of grays and blues and aqua. Matches perfectly and quality is great. The size of the rug was just right for the front door entryway. The colors of the rugs complements the color of my hallway walls. The shipping of the rug was good. The rug came in packed securely in a heavy plastic rolled. This was definitely a good buy for the price of the rug. Beautiful rug. Design I wanted and liked. Excellent fabric. I am very happy with this purchase. "What are the dementions of this rug?" Approximately 3 feet by 5 feet. Beautiful design and I absolutely love the colors. I've bedn looking for just the right rug for my bedroom. This is gorgeous. And the price is amazing.